"Excuse me, teacher. May I go out?" The rest of the school children listened very carefully whether the teacher would give permission or not to their classmate and they were also expecting the teacher to pinpoint the errors in what the little girl uttered. It was a typical school day in the small village where eager school children between the ages of 7 to 12, from standard one to six, learned many subjects and English was taught as a second language. The English teachers were the locals who had undergone training in the teachers' colleges in the country. Studying English did not come easy for the children who were from diverse backgrounds and to make it more challenging, English was not even spoken at homes. Nevertheless, the children picked up the language slowly. In every English lesson, the teachers used English and spoke English only even if sometimes, the children rolled or blinked their eyes in an effort to grasp the language and to be good in it. Blessed were the teachers' efforts in educating the children with their strategic lesson plans that had made their lessons successful. In one of the English lessons, her teacher asked her to read some stories in front of the class. She was a great fan of Cinderella, Razpunzel, Red Riding Hood, Snow White And The Seven Dwarfs, Thumbellina, and the list went on. She liked those stories with a happy ending "...and they lived happily ever after", a phrase that sticks to her mind even to this day. As a little girl, she fantasized being the Princess who met Prince Charming and lived happily ever after - such a sweet dream even time could not tell of its happening. Later, when she reached Standard 6, she began reading Enid Blyton's and Nancy Drew's and felt so inspired to be adventurous and thrilled to become a spy who solved many mysteries. When studying in high school, she started reading romance novels which she could read one each day. The passion grew and among all, she could not help but falling so much in love with Sidney Sheldon's superb novels. Age did make a difference in the choices of the stuffs she liked to read and reading was something which she could not do without. It was like the staple food which at the end of the day really fulfilled her. She did learn Literature and much more in her tertiary education. She loved it though sometimes her head spun when trying to make out what Shakespeare meant in his classical ways. Her little nonsensical mind sometimes thought it was Shakespeare who did not understand her! Nevertheless, she held him in high regard for his great contributions in the world of Literature. She recalled the difficulties she faced in accomplishing her assignments that should include the works of Shakespeare or Robert Frost or any other great writers. Among the ones she loved were Shakespeare's "Sonnet 18: Shall I Compare Thee to a Summer's Day? and Robert Frost's "Stopping by Woods on a Snowy Evening." She remembered those lines in the first stanza which would continue to live in her memory. How nice it was since the first day she set foot in school till her tertiary education and each year showed her progress in academic. It was possible with the dedications of all those who are called teachers. Today, 16 May, is a special day for teachers in my country. 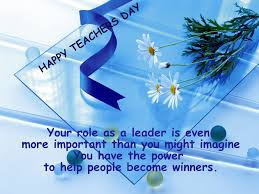 It is Teachers' day which is celebrated nation wide. With this opportunity, I am wishing Happy Teachers' Day to all my teachers wherever you are. A special mention here for Madam Cecilia Goh who had given me much encouragements and instilled the confidence in me to speak and write in English, who guided me with patience, who could bear the simple English I wrote in essays, who always boosted my ego by asking me to read in front of the class though there were some mistakes in my pronunciations, who trusted me that I could go further if I had the determination and passion of learning. Thank you, my dear teachers! does it have the same words there? You had an interesting and beautiful development in education, BB. The immense luck of share the "work" of learning with dedicated people who cared for their job and its outcome. I can follow your experience with English and American Literature, in the learning the language first and then adding the mysterious ways of cultural evolution into Literature. It is a difficult but very interesting way of being part of the world at large. Thank you for sharing in this beautifully written post so many events of your life. It's so much fun, Od, learning another language which has so much differences than our own. We have to follow the rules so that what we say would be understood by others. English was my favourite subject and it will always be. Learning process never stops and everyday is a learning day for me. For instance, visiting blogs is also learning where by I could get insights on certain areas which I don't write. Apart from that my vocabulary grows each day. I have high respect for teachers because of their dedications made me who I am today. From learning A, B, C to counting 1, 2, 3... then reading the great works of great people and whose works become the texts in school and university. Yup, I agree with you on cultural evolution and as you said difficult but interesting. It's my pleasure to share some events of my life which came a long way, with all the difficulties but challenging my desire to achieve what I dreamed of. Hey, hi dear... still remember me? It had been awhile. I had a hard time finding your URL because you are not my twitter anymore and I can't see any updates. I forgot all my other social media that link to yours. Anyway, I am thankful that after a day of search, I found you. Being a teacher myself and teaching English, I am delighted to read this sharing of yours. In my eyes or at least the belief I held in teaching is to make sure every students have that love; the love for that subject and grow in there. Alright, that's all for now. It is exam period for my students here thus I had been busy. Hope to hear from you soon. By the way, I progressed from my writing style, yup, I am still working my way in hope to reach my dream, a published author one day soon..
Take care and God Bless..
Hi Krislin! Of course, I do remember you. Glad you could find me. I'm happy to see you again. Thank you for taking your time to read this post. I don't know when is Teachers' Day in Singapore. Anyway, I'd like to wish you Happy Teachers' Day!